I really like playing different ukuleles and writing up my thoughts. Typically my ukulele reviews are ukuleles that are at the cheaper end of the market but I’m open to review anything really (assuming I can afford to buy it). If you’ve got a product that you’d like me to take a look at, then please get in touch! If you’d like to get a little more educated before you make your purchase take a look at my ukulele buyers guide. 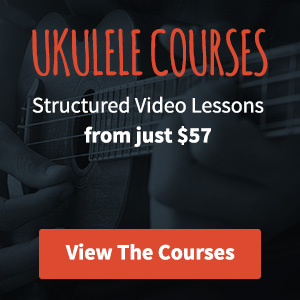 If you’d like to see my current recommended cheap ukulele list (under £50/$70) then check out the best ukuleles for beginners right here. Check out my ukulele accessory reviews here. The Duke Banjouke is a tenor scale acoustic/electric banjo ukulele that made its way to me all the way from New Zealand. As I’d never played a banjo uke before picking up the Duke this is less of a review and more just my thoughts having played around with it for a while now.